Circassian activists believe that the policemen who detained lezginka dancers in Gelendzhik should be brought to justice. The "Caucasian Knot" has reported that on August 13, YouTube published a video showing a detention of a man by policemen and Cossacks. The video is entitled "Cossacks and the police tie a lezginka dancer in Gelendzhik". 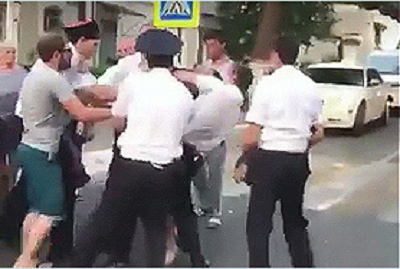 According to eyewitnesses, the police detained four persons for dancing lezginka in the street. Meanwhile, a pepper spray was used in the course of the dancers' detention, and a female tourist was injured. During the detention of the dancers, the police claimed that "lezginka dancing was banned in the Krasnodar Territory," eyewitnesses said. On August 14, the Ministry of Internal Affairs (MIA) reported that the court found two lezginka dancers guilty of petty hooliganism and failure to obey to a lawful demand of the police and sentenced them to five days of arrest. Later, one of the dancers was released. Asfar Myss, the leader of the religious organization of Muslims in the Takhtamukai District of Adygea, a member of the Public Council under the Department for the Takhtamukai District of the Russian Ministry of Internal Affairs (MIA), has reported today about his meeting with the deputy chief of the MIA's Division for Gelendzhik regarding the incident with lezginka dancers in Gelendzhik. According to Asfar Myss, when talking to the deputy chief of the MIA's Division for Gelendzhik, he has understood that "the police top-ranking officials realize the stupidity of their subordinates' act, but cover up their fault." Asfar Myss has emphasized that the deputy chief of the MIA's Division for Gelendzhik assured him that "there was no prohibition to dance lezginka in the city." However, in the Krasnodar Territory, "there have long been secret bans and restrictions on ethnic and religious grounds," Asfar Myss noted. "For example, there is an implicit ban to build mosques in the Krasnodar Territory. No one, of course, openly declares that, but the fact is that for 20 years, believers cannot achieve the opportunity to build a mosque in the capital of the Krasnodar Territory," Asfar Myss emphasized. According to him, further investigation into the incident "should result in the punishment of the policemen who exceeded their power."